LATAM Frozen Bakery size was estimated over USD 4.3 billion in 2017 and the industry will grow by a CAGR of more than 4.4% up to 2024. Packaged food industry has been gaining prominence in Colombia in the past few years. The value of global packaged food sales has increased from USD 2,348.9 billion in 2014 to USD 2,516.2 billion in 2017. Colombia is the third largest country in Latin America with a population of 49.1 million in 2017 after Brazil and Mexico. Colombia has witnessed a rising trend in the growth of its convenience food market. According to the National Association of Colombian Business, annual per capita consumption of processed foods was estimated at around USD 330 in 2016 and is expected to further grow in the forecast timeframe. Product is also positively influenced as majority of the frozen bakery products such as frozen dough are utilized for making packaged food including pizza, bread, arepas, etc. One of the major drivers of this growth is rising urbanization in the region. In 2017, close to 77% of Colombia's total population lived in urban areas and cities which has increased from 73% in 2007. Consumer demand had increased for ready to make products to facilitate their hectic urban lifestyle. Rising women employees in the workforce has further facilitated the growth of frozen bakery products. Rising gross domestic product of Colombia which accounted to be around USD 309.2 billion in 2017 is another driving factor. The baked goods are the leaders in the packed food industry, though, this category remains mostly dispersed owing to the artisanal players accounting for 67% of value sales in 2017. This means demand for freshly baked products have been rising over the years. Growing sales of bakery products also signify greater share of freshly baked products. This is because penetration of frozen bakery products is limited in the Latin America. 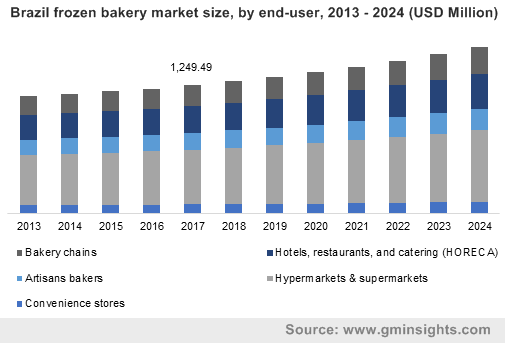 Hence, this rising demand for freshly baked products is most likely to hamper the growth in LATAM frozen bakery market. On the basis of recipe, the LATAM frozen bakery market is segregated into bread, viennoiserie, patisserie and savory snacks. Among these, bread clutches more than 60% of the volume share in 2017 and is likely to expand its share by 2024. Establishment and expansion of fast food chains such as Dominos, McDonald’s, etc. which uses a large amount of bread for its products will be a major factor driving frozen dough demand for making bread. The advantages of using frozen dough for bread making process will also augment the industry growth in coming years. Based on revenue, viennoiserie was valued more than USD 700 million in 2017 and is anticipated to enlarge its revenue share in coming years. These are the baked goods which are made from a dough in a manner like bread but with added ingredients such as butter, milk, cream, sugar, etc. giving them a sweeter character. Rising household income levels in the country coupled with increasing penetration of restaurants, bakery chains, and fast food chains, across Colombia will be a key reason driving the usage of frozen dough for viennoiserie products. Based on products, LATAM frozen bakery market is divided into ready-to-prove, ready-to-bake and fully baked. From these, ready to bake products clutches more than 60% of the revenue share in 2017 and will show the positive growth in coming years. This is all due to the increasing usage of the product in making bread and also in making cookies, cakes, pizza, bread, etc. The lower preparation time of the product makes it popular among bakery chains and artisan bakers. Fully baked frozen products held around 18% of the revenue share in 2017 and will increase its share in entire segment by 2024. Extensive usage of the product for making the bakery goods such as breads, rolls, pastries, etc. due to its low preparation time characteristic. Quick preparation time makes it ideal for restaurants and bakers that want to maintain a quick and responsive supply chain without the need for keeping a large inventory of finished products. 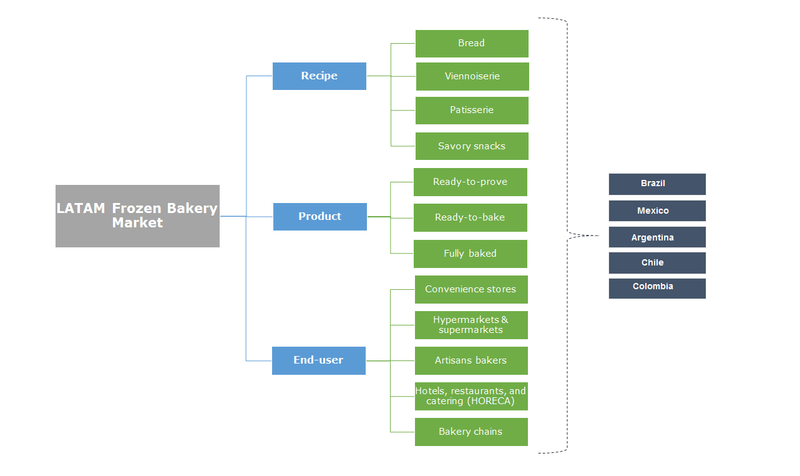 On the basis of end-user, the LATAM frozen bakery market is bifurcated into hypermarkets & supermarkets, artisans bakers, convenience stores, bakery chains, hotels, restaurants, and catering (HORECA). Hypermarkets & supermarkets held close to 40% of the volume share in 2017 and will enlarge its share by 2024. This is all due to fast transformation of the retail sector from traditional grocery stores to large supermarkets in a short amount of time. In the last decade major domestic and international supermarket chains have opened new stores in Colombia, of varying sizes and at intense rates. Based on revenue, artisan bakers were valued over USD 580 million in 2017 and is likely to increase its revenue share by 2024. Artisan bakers are the small & medium sized bakery outlets are a common site in Colombia and caters to demand from both households and commercial establishments such as restaurants. On the basis of revenue, Mexico was valued around USD 1.3 billion in 2017 and will expand positively in coming years. This is all due to the surge in consumer preference towards frozen and convenient product across the country has increased sale of frozen bakery products in quick service restaurants, artisan bakers, hypermarkets, catering & industrial etc. Hyper markets & supermarket growth have increased all over Mexico over the past decade and is expected to increase at moderate rate in coming years. Colombia was valued around 170 kilo tons in 2017 and is likely to increase its volume share in near future. Fast economic development indicators in the country has also led to a steady rise in modern retail formats. Penetration of supermarkets & hypermarkets, restaurants & food service businesses, fast food chains, and cafes have increased in the last two decades. This will boost demand for bakery products such as breads, pastries, cakes, etc. during the forecast timeframe and in turn augment the LATAM frozen bakery market. 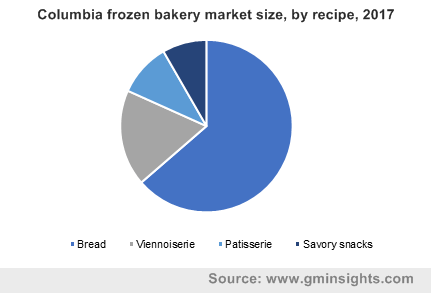 LATAM frozen bakery market is highly fragmented with major players such as Bimbo de Colombia, Europastry Colombia, General Mills, Dawn Food Products, Panificadora El Panque, Comapan, Pan Pa Ya, BredenMaster, Rich Products Corporation, Don Maíz SAS, etc. The companies are expanding their business across the region through acquisition, mergers and by launching new product in the market. For instance, In September 2017, the Groupo Bimbo expand its production capacity in Colombia to meet the rising demand. This will positively influence the LATAM frozen bakery market growth in forecasted timeframe. LATAM frozen bakery market is driven by the its end-user industries coupled with increasing demand for convenience edible products across the region. The region has been witnessing fast economic development along with steady rise in employment rate will boost the entire ready to eat food industry and this will significantly influence LATAM frozen bakery market. Moreover, development of different retail channels across the country will also be a major driver for the industry growth in forecast timeframe.